I have a platinum gourami. 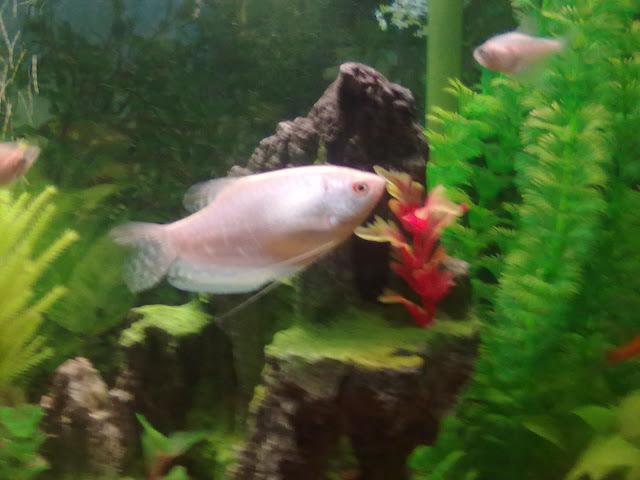 One of my friends recently visited my home and saw my aquarium, when he saw my gourami, he told that it is giant white gourami. I bought this gourami from one of the LFS in Bangalore and when I bought this fish, the LFS guy told me that it is a platinum gourami. I have attached couple of pics to this post, could some one tell me whether it is giant white gourami or a platinum gourami. It is not very aggressive as of now. At times it chases a male sail fin molly and a white skirt tetra but its a very quiet fish. I did lot of research on the web and could not find an answer. If it is giant white then I might have to move it to a bigger tank. At present the size of the fish is around 3.5 inches and can this be a giant white gourami and if so what would be the approx. size it can grow to? Hi Emmanuel, Thanks for your reply. Which type of Gourami is it btw. Could you also let me know how to differentiate between a normal gourami and a giant one. its a moonlight gourami i think so ??!!!!!!!!! Definitely not s giant gourami. The face is different for giant gourami like it's smashed and it has a small hump too. My LFS guy here has about 4-5 golden giant gourami that he hasn't sold for last one and half years. No one buys them cos they are huge and not much of a looker(IMO). It's not a moon light Gourami. It's not a Gaint Gourami. 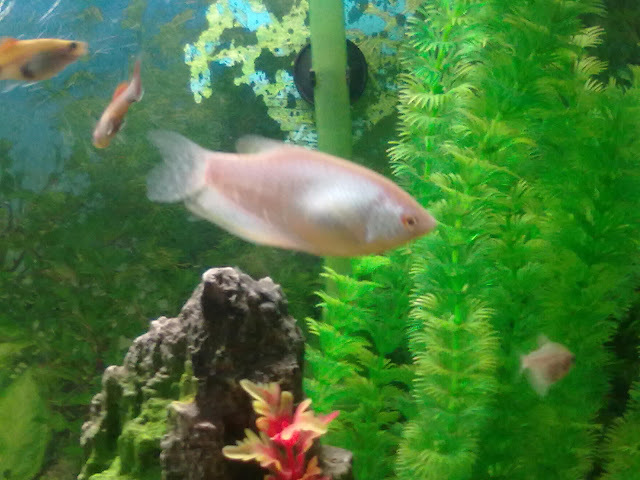 It's a selectively bred variant I think and you bought it as a platinum Gourami so be it. I'm sure it's a platinum gourami. Thanks a lot guys. That was really helpful. FYI, Giant Gourami looks as ugly as this. it seems to be a man made variant, it is not a giant gourami. That one looks like a mod of Golden gourami version, which has been in market for quite sometime. Males would be dark yellow. Agree with Sai above, looks like less pigmented version of Golden Gourami. However, some better pictures with & without flash will help. Their females have such shiny platinum-lookalike bellies. Parthapratim - No offense meant, buddy.